With summer right around the corner, many people are in a panic to lose fat. However, most go about it the wrong way and in their haste they actually slow down their fat burning. Faster fat loss starts with making sure you are not making any of these mistakes. In an effort to lose fat fast, most people turn to cardio. Some do just cardio for their workouts, which does work a bit for beginners, but rarely gets most people to their goals. 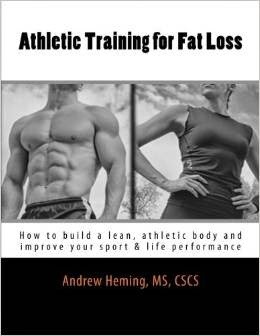 (For more information on the limits of cardio for fat loss, click HERE. To learn about the best type of cardio for fat loss, click HERE). Others add extra cardio to an already decent program. Adding extra cardio, especially the steady-state medium-intensity types (e.g. jogging) can increase cortisol, waste away muscle tissue and hinder your ability to recover and perform your main training. Many people also add extra ab exercises to their training because the mid-section is a common problem spot. While this does not drain your energy as much as extra cardio, it beats on your low back (note: your low back does not appreciate the repeated bending of crunches and sit-ups). Also, since you cannot spot reduce certain areas by training them (click HERE for more info on spot reduction), you waste time that could be spent doing big, effective exercises (e.g. squats) that will actually help melt away unwanted fat. They do not give you enough calories or nutrients to sustain the hard training needed to get a lean, athletic body. They are unsustainable and thus you gain all the weight back (and more) when you go off the stupid diet. Nothing short of a permanent dietary change will result in permanent fat loss. Sleep provides a wonderful opportunity to recover from intense training and build hard, metabolism-raising, fat-burning muscle. It also reduces bad hormones like cortisol and increases good hormones such as growth hormone. Want a real secret to a great physique – get more sleep! While stress can cause weight loss, it often causes muscle loss – not fat loss. Stress releases cortisol which wastes away your fat-burning muscle and is linked to abdominal obesity. It also hinders your ability to recover from and properly progress your fat-burning workouts. Now that you know what mistakes to avoid, next time we will look at what to do to accelerate your fat loss!